When I started this blog I wasn’t really certain what it would end up being about, other than describing things that I was doing to make my life a bit more sustainable… now I look at it, I discover that it’s mainly about growing things and making things from natural fibres. It covers some places I have visited or taught at, along with some comments about what’s going on in my world. As for me, I have a doctorate in ecology and have been interested in conservation and sustainability for a long time. I teach (adults) a whole range of courses related to ecology, conservation and habitat restoration as well as an occasional introduction to permaculture. I have just completed my diploma in applied permaculture design. Oh, and I’m a scientific editor too. Many thanks… I just wish I could take photos as beautiful as yours! Hi! That’s a very cute pair of knitted snails in your blog’s banner! If you are keen to share, I’d love to know more about your work as a scientific editor. The snails are from a lovely book: Amigurumi Knits by Hansi Singh… I use them when I am teaching permaculture. 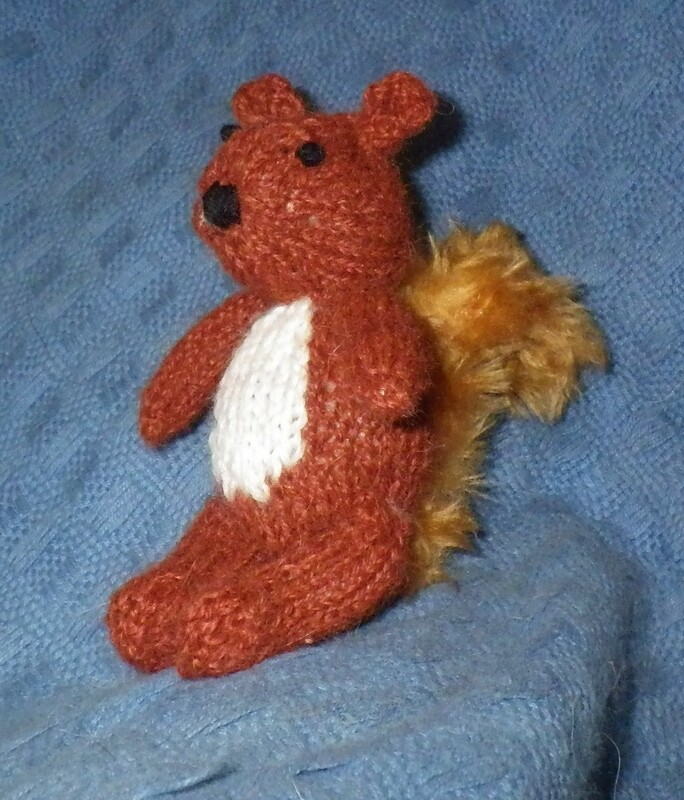 I must get round to posting about some of my other knitted animals, but will have to photograph them first. I edit scientific (and other) papers for authors who do not have English as their first language but want to publish in English (the language of many high-profile journals). They write their papers as best they can and I ‘polish’ their writing to make it publishable. I originally worked almost exclusively on forestry and ecology papers, but I am much more versatile now, covering a wide range of sciences plus education and anthropology. The advent of the internet has been a boon, especially now it is possible to send and receive remarkably large files – all my clients are overseas, but communication is so quick and all my work is done on a computer screen, so there is never any paper. All this means I can work from home and combine earning a living with gardening, cooking and craft projects… as well as blogging! Thank you so much for your reply; I really enjoyed reading about your work as a scientific editor. It’s great to hear how technology has aided the editing industry. Good luck with all your work and I look forward to seeing some more knitted animals and your blog posts too. Wonderful blog you have here! Thank you for the like on my blog about my Lasagna Garden! My neighbor told me about this type of garden. I am hooked! The garden is doing very well! Just letting you know I’ve given you the Very Inspiring Blogger Award! http://jammiekern.com/2012/07/31/the-very-inspiring-blogger-award/ Thanks for all your information! I love your snail photo! Thank you… they seem to have become my trade mark! I am looking for Bamboo Twine and cannot find it anywhere. I live in Canada but the teacher I am searching for might be willing to import it if I can find a brand name. She wants her class to build bridges with it. Thanks for any help. I buy my natural fibre twine from Sorazora (http://sorazora.com), but their bamboo twine is very silky and may not be suitable. Anyway it’s probably worth contacting them because they do specialise in natural fibres and may have some ideas. Many thanks for the nomination. I’m rubbish at getting round to responding… I still have one to do from the wonderful Lord David Prosser (Barcetshire diaries) from months ago, but I am very flattered! OK, I’ve finally set up an awards page and started doing acceptances… yours will be the next one I write about. So sorry it’s taken me so long to get to this point, the time has just disappeared this year! And I must apologise for responding to the one from Mr Rooster (see below) before yours. Thank you… that’s one of my November NaBloPoMo posts taken care of!! OK new page for awards set up… I promise to get round to them all eventually! Of course, oftentimes the snail follows very slowly!! I’ve discovered so many lovely blogs recently and I’m very pleased to have found both yours. Thank you very much! 🙂 Welcome to both! Right, I’ve set up an awards page, so I promise to get round to accepting properly soon! I am going to try to get organised about all these awards… I think there’s about four or five I haven’t thought about yet (sorry people). Perhaps a special awards page is in order. However, for the time being,thank you so much! I think it’s down to my short attention span!!! Lovely blog. I’m a bit rubbish at reading other blogs but try to catch up every now and then. I notice in a recent blog you mention you’re in Wales. Dare I ask whereabouts? We’ve just moved to Wales – in my case ‘back to’ as I was brought up in Wales from the age of eight – and we’re loving it. Very excited that spring is on the way. We are in Aberaeron – where are you? You’ve been so very nice that I nominated you for the Liebster Award. Here are the details: http://willowscottling.wordpress.com/2014/01/16/liebster-award/. Thank you! Many thanks… I’m a bit behind with awards, but I’ll have a blitz on them soon – I promise! Hi I see you have a Vantage Vue, do you have it online? It would be good to compare figures as I have a weather station near Lampeter. We haven’t got round to putting it on-line yet… is yours? If so, how have you done it? Thanks Martin – I’d be interested to hear about the response. Hi Jan. I am the lapsed member of the Diploma group, looking to “jumpstart” myself this year. I love your blog and its title. I want to start a blog myself and I am wondering how you did this and who hosts it. I already have a domain name and am tempted byiPage’s introductory offer, but would appreciate you telling me about your experience. Hi Barbara… losing momentum seems to be a real problem with the diploma… I’m not sure whether I would have found it easy to start again if I had ground to a halt! My blog is here on WordPress and they host it, but I’m not sure how to use it if you already have a domain name registered. I really like WordPress and find it easy to do most of the things that I want to do. E-mail me or message me on FB if you have any specific questions or want a bit more support! You’ve been beaten to it by about 2 days! Kate Chiconi has already asked, so look out for my post on 28th! I love a virtual knit and natter group! Not to mention a real one!!! Have only just now found your comment on my blog! How the hell did I miss that? Love your blog and thank you for stopping by mine. Thank you! Easy to miss a comment or two… I can see that I currently have quite a few to catch up with! enjoyed meeting you over at KerryCan–we have excellent taste is friends 😀 The pieces you sent her are exquisite. So much fun. I can’t even imagine putting something like those together. Must take so much patience! But I love the colors and design. Love your mission and that you care so much about the planet. Very cool. I’ve only been crocheting for about three years, but it seems to bring out the creativity in me! The rest of the stuff, like caring for the planet, I’ve been doing for longer! Very happy to see you still on WordPress. I am an old familiar face using an alias for the time being… But, I will soon return and unveil the mask… Sorry I disappeared from WordPress in January 2014. Keep up the good work and GET DIRTY! P.S. I don’t have a mustang and my name isn’t Henry. Well I guess you were formerly TBR… if so you can find a blog post about how sad I was that you disappeared at the time. I have been getting the blog ready, pretty much as before. So far it has been private, which has been a bit strange writing posts to myself… SO, very shortly, TBR will be riding (writing) again. Thank you for following my blog. I like what you do very much. I am hyper-concerned for the planet and my daughter and her family work in conservation. Hello Viv… I’ve managed to sort out following all the sisterhood blogs on WordPress, but not to reading them all… I could have spent all afternoon enjoying them, but sadly I had to go and see the accountant (oh, joy!). Anyway, it’s lovely to make contact with more creative folks from around the world… and the sketchbook is such a fantastic idea! Do you think stringing beads would have a similar effect on the alpha brain waves? I am thinking of introducing stringing of beads in a residential treatment setting as an example of a mindful activity. Yes, I think so – any small repetitive activity that does not require lots of concentration should work. I also highly recommend wet-felting – anyone can do it and you can easily make flat pieces of felt, balls or a simple pouch… it can be a little bit messy, but it’s only soap and warm water, so easy to mop up. Hi Marina… I got to you via Anne Lawson…. I’ve been so busy following all her links I haven’t had time to browse through the blogs she pointed me to! I need to settle down for an hour or two with a big cup of tea and do some exploring! This is a bit off topic (or any recent topics anyway) but you were talking at some point about Scientists who also do other things and I wondered if you have read any of Barbara Kingsolver ‘s books? She is a biologist who also writes fiction (and non-fiction) and I think the biology shows through! I really love The Poisonwood Bible, but I’ve only ever read one of her other books ‘Prodigal Summer’, which I really didn’t enjoy and which put me off seeking out any of her others. Gosh and I still haven’t got my head round trips away… must do that soon. I was thinking about ‘Animal, vegetable, miracle’ which is non-fiction and about their family experiences of trying to eat locally. I’ll have to see if they have it in the library. I love your account name, why did you choose it? I also love the crochet snails in your background photo… They are simply adorable! Looking forward to reading some of your articles later. Hi, I am so happy to have discovered your blog, so interesting and inspiring! I’m an observer of nature, not professionally but with much enthusiasm. And now I am about exploring more of your blog, which by the first look contains much that interests me. hello Agnes – I hope you enjoy it!